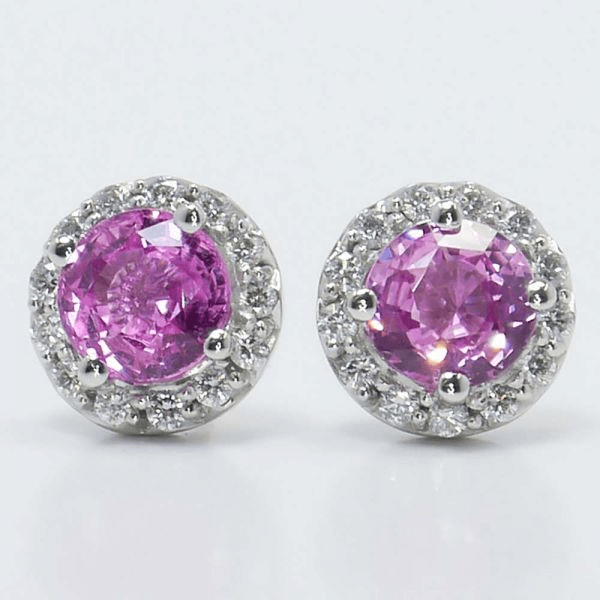 Pink Gemstone Stud Earrings: Should You Get Diamonds or Sapphires? There’s nothing more feminine than a pair of pink stud earrings. As a fun and flirty fashion accessory, stud earrings make a great gift for women, whether it’s for your significant other, relative – or even yourself! When it comes to pink stones, the choice often comes down to pink sapphires or pink diamonds. What’s the difference between these two gorgeous gems? Items in the jewelry world are often priced based on rarity. The less common a certain stone is, the more expensive it will be. Pink diamonds are very rare and about to become even rarer. Most pink diamonds come from the Argyle Diamond Mine, which will close permanently in 2019. Without this mine, there will be a scarcity of pink diamonds, which will cause the price of these stones to skyrocket. Because pink diamonds are so rare, it may be difficult to find a jeweler who has them in stock. You may need to specially order a pair of pink diamond stud earrings, which will likely be more expensive than just buying a pair of earrings from the store. Pink sapphires are rare, but not nearly as uncommon as pink diamonds, so buying earrings with this gemstone is much easier. You will be able to visit different stores and online sites, see various designs, and compare prices to ensure you have found the best deal. You won’t be able to do this if you are looking only at rare pink diamonds, so keep this convenience factor in mind as you make your decision. Pink diamonds and sapphires do have one thing in common: the color pink, of course! But the shade of pink may vary between diamonds and sapphires. Pink diamonds tend to be a lighter hue, while sapphires can be many different shades of pink. 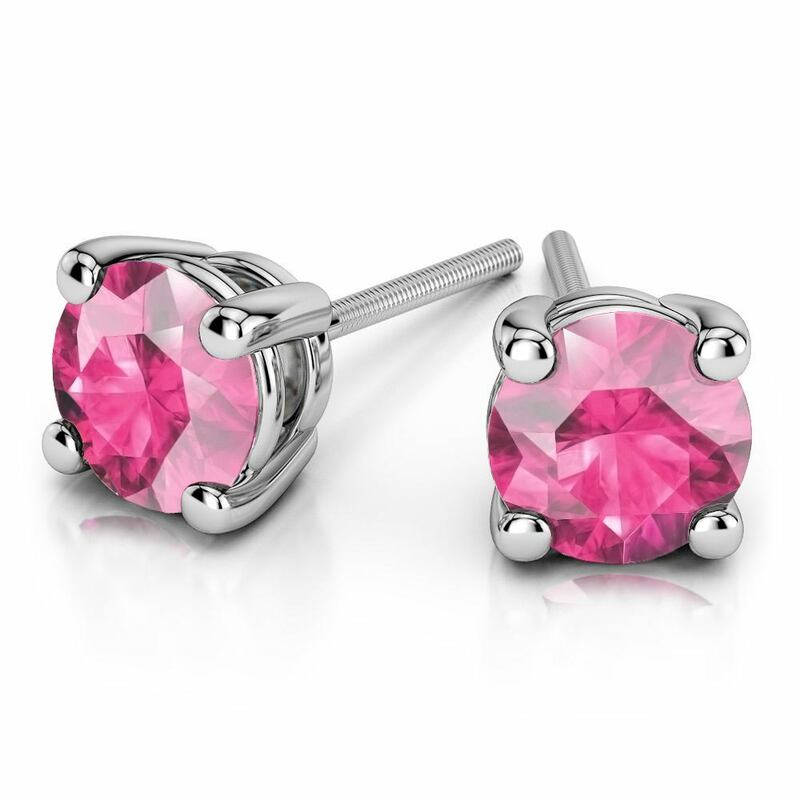 If you are looking for darker pink stud earrings, sapphires are the right choice for you. Sapphires can range in color from pale pink to dark pinks that almost look red. Many women end up picking sapphire earrings because they love choosing from such a wide variety of colors. You may already know that the diamond is one of the hardest stones in the world, scoring a 10 out of 10 on the Mohs scale of mineral hardness. This means that it is very difficult to damage or scratch a diamond since the surface is so tough. Sapphires are not exactly delicate themselves. Sapphires have a 9 out of 10 score on the Mohs scale, which means they are almost as durable as diamonds, so they will also generally be scratch-proof. If you’re looking to wear the rarest of gems, you can’t go wrong with a pink diamond. But for many women, sapphires are the better and more affordable choice. Now you’re ready to start shopping for the perfect pair of pink gemstone stud earrings that will add a little color to your jewelry collection!